Bill Drummond, the co-founder of eighties avant-garde band The KLF, will deliver the keynote speech and present a talk on Thursday 5th December, Books: 12 Years, 25 Paintings, 100 Questions, & The 17, as part of a three-day event celebrating independent publishing – Volume: Birmingham’s Art, Book & Print Fair. And tomorrow afternoon we’ll begin proceedings at 1pm at the library with a fascinating afternoon delving into the opportunities that new technologies bring to publishing and writing, this will include a Writing for Digital platforms workshop and a panel featuring Clare Reddington, Director of the Pervasive Media Studio in Bristol, with Dave Addey, Managing Director of leading app development studio Agant; Tom Abba, lecturer in narrative theory at UWE, Bristol and member of artist collective Circumstance; Charlotte Quickenden, Managing Director of digital agency Bow Software; Laura Kriefman, Founder and Choreographer with innovative dance company Guerilla Dance Project. 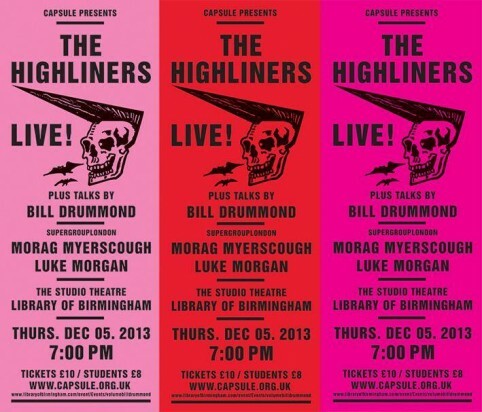 It’s only £3 for the workshop and panel from www.birmingham-box.co.uk, or if you have a ticket for the Bill Drummond event this entitles you to free entry – just email admin@capsule.org.uk with your ticket confirmation.